Only this year that I had tasted Radish Cake in Binondo. Yup, it’s at Wai Ying again. I don’t usually experiment tasting other Chinese dish in this restaurant but without fail, I always love their dish. One night after work, my friends and I decided to eat at Wai Ying after work. It’s our way to catch-up and relieve ourselves from stress. Then, one of my friends ordered Radish Cake just to try how it taste. It comes in three pieces, fried to golden brown and just for around Php80.00. We were blown away by how delicious it is and ordered another set but this time we asked the waiter to toast it a little more for crunchier texture. Their Radish Cake is so succulent. The exterior is crunchy but when your teeth sink into the dish, the inside is soft and so flavorful. Today, I decided to cook this dish. However, since I can’t find authentic Chinese Sausage in the grocery, i just used chorizo Macau. I used half a kilo of radish and shredded it. Oh boy! This dish requires lots of chopping and shredding. The hot weather is really tiring me to work in the kitchen so I’m exhausted after cooking this dish but it’s worth the energy. This recipe is best eaten when fried. Most of the recipes I found suggest frying the sliced radish in a thin layer of oil in the skillet. However, in my case, I prefer all sides to be crispy and golden brown so I decided to deep fry my radish cake. Boil together radish and water for 40 minutes. Drain and set aside. In a frying pan, combine chorizo Macau and water. Start heating until the fat from the chorizo ooze out. Saute for 5 minutes. Add mushroom. dried shrimp, salt and pepper. Saute for another 5 minutes. In a bowl, combine boiled radish and sauteed ingredients. Mix until well incorporated. Add rice flour and water. Mix until a consistent batter is formed. Pour in 8×8 oiled baking pan. Steam for 40 minutes. Cool completely. Slice into 2×2 and deep fry. Serve with the dipping sauce. Do not commit the same mistake as I did. Let it cool completely before cutting. It will be firmer compared when it is still warm. 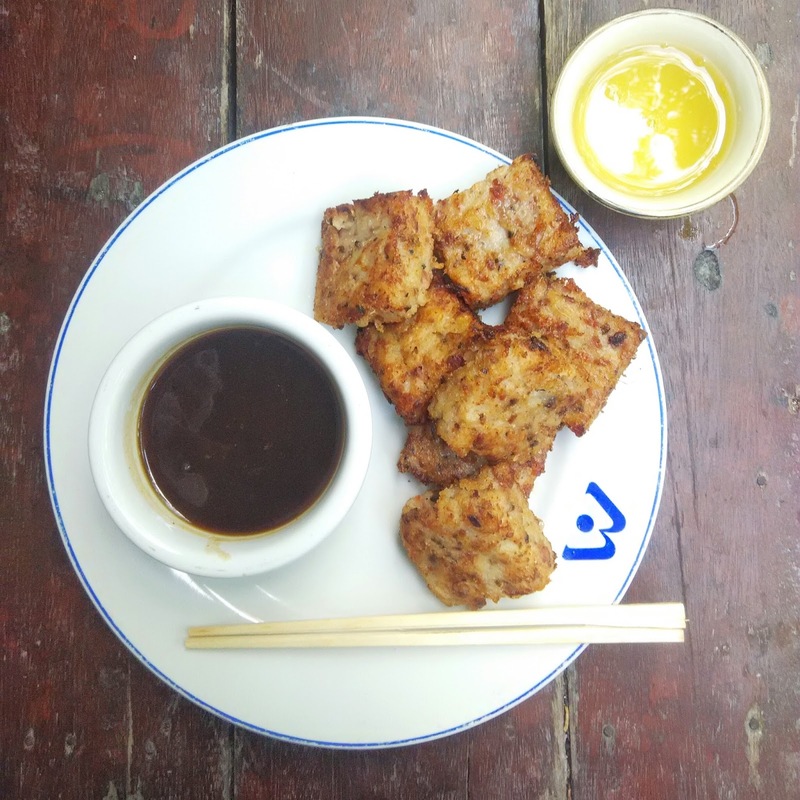 For the dipping sauce, combine oyster sauce, light soy sauce, sugar, pepper and water. Simmer for three minutes. Combine cornstarch and water, mix well. Add into the dipping sauce little by little until desired consistency is achieve. You can also add chili flakes for extra kick.